I've noticed that there is no Practice Quiz option with Quizzes: Next. Will this be added? Is there a workaround for this? Hello Cassie. I have been going through older Quizzes.Next questions to see if updates are appropriate. Reviewing other posts, the question of a student view has led to some spirited discussion (see Quizzes.Next Preview function) but a practice quiz option hasn't come up as often. I know that the goal for Quizzes.Next development is to achieve feature parity with classic quizzes as quickly as possible. In terms of a practice quiz, have you considered whether making the quiz worth zero points or including the quiz in an assignment group worth zero percent of the students' final grade would be an option? 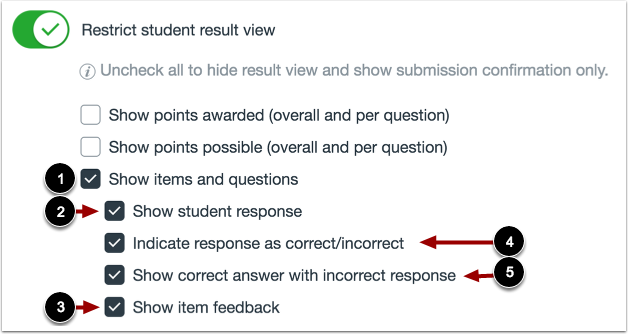 Recently the option was added to hid student responses to a quiz (see New option for hiding quiz responses in Quizzes.Next) which may help in using a standard quiz for practice. To create a Practice Quiz, edit the quiz/test from the Assignments page. Set Points to 0 and turn on Do not count this assignment towards the final grade. With the latest release of Quizzes.Next (2/16/2019), new options are available for hiding the student responses. In this case for surveys, Indicate response as correct/incorrect and Show correct answer with incorrect response both need to be unchecked. In order to create a survey in Quizzes.Next, in addition to setting the points to 0 and not counting it towards the final grade, Restrict Student Result View must be turned on, so that the right/wrong indicators will not activate.